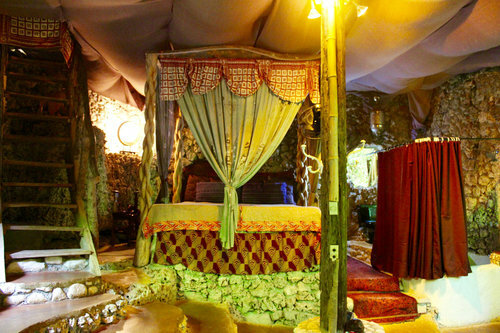 Our inimitable 'Comfortably Rustic' rooms are unpretentious but stylish…and replete with comfort! Here you can anchor your connection with nature. 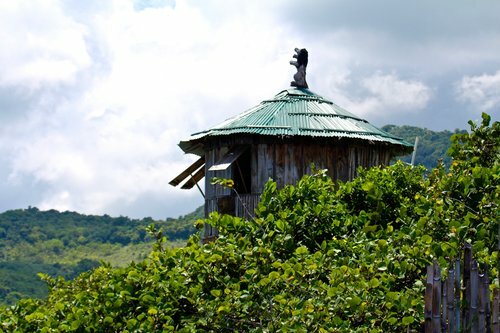 These tree houses, huts and a single house are utterly unforgettable. Choose from an open sea view or private secluded garden location. 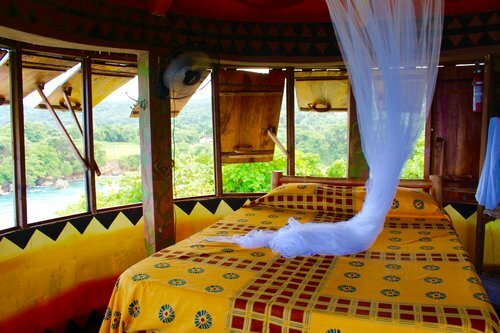 Our Safari Chic huts and tree houses are fit for African kings and queens, with double- queen- or king-sized beds, private bathrooms and personal refrigerators. The Bamboo Garden Room also has a kitchen. The jewel in Great Huts’ crown, this three-story stone house has a king-sized four-poster bed downstairs, with king, queen and double beds on the floors above and two bathrooms with tub and shower. 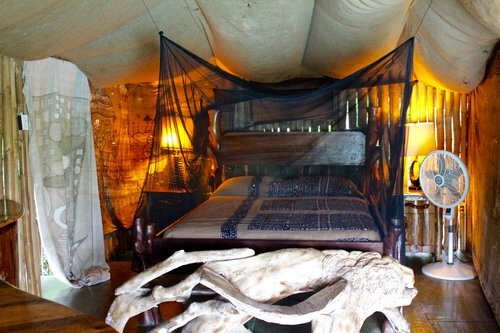 Dramatic African sculptures and paintings and stunning garden views make it a 5-star suite! 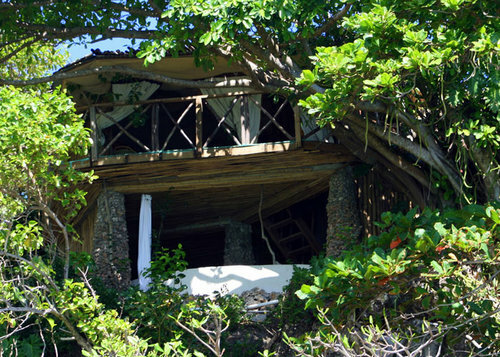 This two-story tree house offers spectacular views of Boston Bay and the Caribbean, an open-air (but still fully private) bathroom with a canoe-shaped tub/shower, and exclusive use of the adjoining Royal Lounge Bar after hours. It has one queen bed and two single bunk beds downstairs. This whimsical favorite of our guests features breathtaking panoramic views of the Caribbean, our swimming pool and gardens, and the mountains of Jamaica. Enter by ladder up to the viewing deck, with its capacious swinging patio chair. The sleeping quarters above have retractable window-panels, a queen bed, and a bathroom with shower. This bi-level retreat is our owner's favorite. The ground floor features a handsome stone-carved bathroom with private Jacuzzi and shower, and open-air sea and garden views. A staircase takes you to an outdoor lounge deck with a hammock, sunbed and even better prospects of the Caribbean. Inside you’ll find the bedroom proper and its king bed. Carefully built around an actual almond tree, this arboreal home boasts sea and garden views from its ground level bedroom, but the vistas get even better when you climb the stairs to the master bedroom and its huge bathroom. Before long you’re almost part of the almond tree itself (would that make you a nut?). Royalty Room. 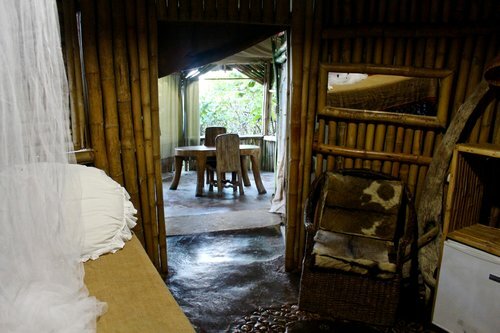 This 50ft long en-suite bamboo hut with large bedroom, sand-flooring, wooden carved canoe bathtub and shower will make you feel like you really are in Africa! Private kitchen facilities and entertaining area with inside bar as well as open dining area outside turn this room into a home-like vacation. 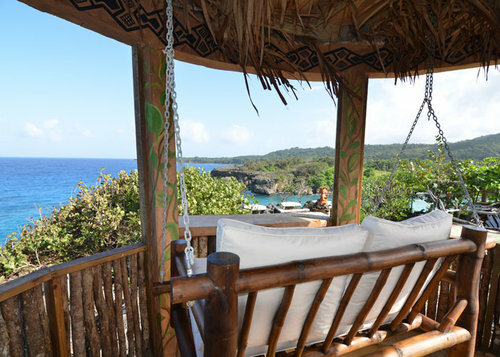 Perched amid mature sea grape trees, this two-room hut at the far end of Great Huts has a separate dining area with stunning cliff-side views of the Caribbean, an outdoor soaking tub, and a garden shower restroom. 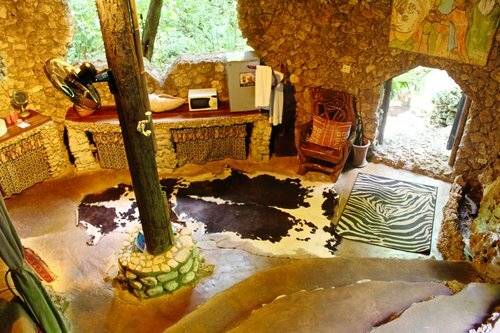 Named in honor of the Lemba tribe of Southern Africa, this large bamboo shack has a singular saloon-like entrance and semi-open architecture that promise an unusual fusion of openness andprivacy. 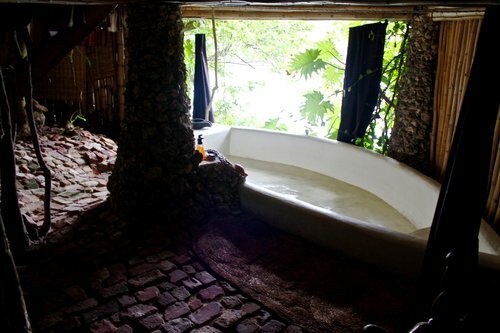 Contemplate an expansive African canvas "wall" from the king-sized bed or feast your eyes on the surrounding gardens as you loll in the over-sized tub. Queen Nyabinghi once led a rebellion to secure her people's freedom. 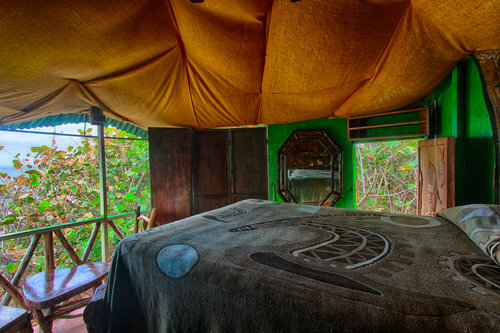 The hut that bears her name is an icon of freedom, perched ten feet up in a tree, its breakfast nook and bed (queen sized, of course) overlooking the Caribbean and the start of our breathtaking cliffside Snake Trail. You'll feel like you have the whole world to yourself, with the infinity pool and yoga deck not far away. This is our newest tree house, but it's already a guest favorite. Solo get away? Backpacking the Caribbean? 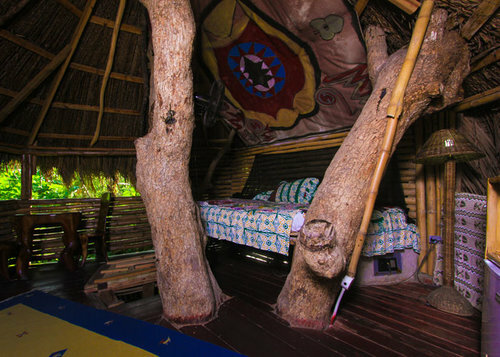 Ever mindful of our budget-conscious guests, Great Huts is pleased to include affordable, down-to-basics lodgings that gives everyone a chance to experience the natural splendors of our Paradise on the Edge. Campers enjoy private permanent structures (aka huts) with shared bathroom facilities that are as convenient and impeccably maintained as all our amenities. These are some of our most popular rooms! 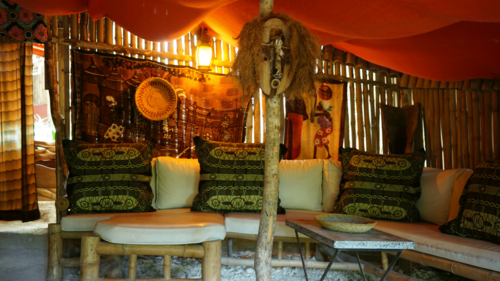 A decidedly unconventional (even for us) nomadic stick hut with an antique brick floor, festooned with richly textured wall hangings that suggest an authentic tribal African atmosphere. Two double beds can accommodate four in tranquil repose.